Lake Manyara Tree Lodge is set in the heart of a mahogany forest and is the only lodge in the diverse Lake Manyara National Park in northern Tanzania. It is the newest addition to CC Africa’s portfolio of luxury safari lodges on the northern Tanzanian safari circuit. From soaring groundwater forests and a tranquil lake, to the mountain escarpment of the Great Rift Valley, Lake Manyara National Park boasts an incredible wealth of habitats and diverse African wildlife. Guests are offered an exciting, interpretive safari experience in game-rich surrounds which include large herds of elephant and buffalo. The Lodge, which was designed to exert minimal impact on the environment, is situated in the remote southwestern region of the Park. Here the Great Rift Valley is at its most impressive, with the Escarpment dropping some 500 metres/1640 feet down to the flamingo-rimmed shore of the lake. Lake Manyara Tree Lodge is owned and operated by CC Africa. The camp closes in April & May. Ten elegant stilted treehouses are cradled in the boughs of mahogany trees, ensuring privacy for all guests. 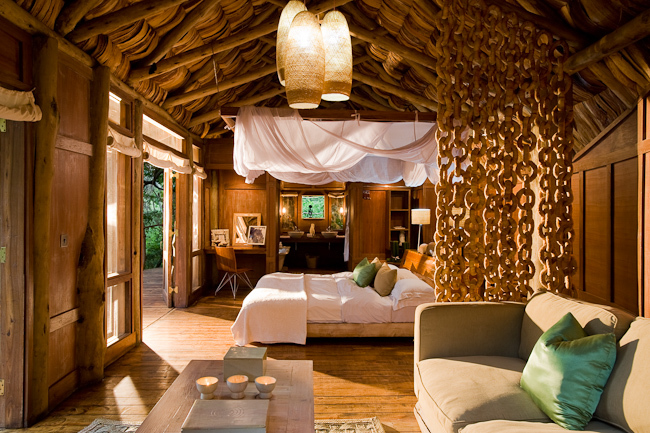 Built of timber and makuti (palm fronds), the interiors are bleached, earthy and stylishly understated. Rooms are spacious with sitting areas and viewing decks. Ensuite bathrooms with a bath, outdoor shower, twin hand basins and private w.c..
Each tree house suite features large windows to invite the lush forest inside. The classically elegant rooms are fitted with contemporary furnishings in neutral colours and textures. Bedrooms have overhead fans, mosquito nets and earthy, understated features. Overlooking a forest boma (outdoor dining area) lined with ngalawas (dugout canoes), the guest areas are soaring spaces housing Dodoma artworks and tactile fabrics. An interactive kitchen allows guests to observe the preparation of delicious Pan-African cuisine which may be enjoyed in the theatrical boma, on dining decks, or on your private viewing deck with spectacular forest views. Breakfasts and picnics are also served on the lakeshore. The Lodge has a Safari Shop featuring signature community craftwork and a range of lodge branded safari clothing. All CC Africa lodges are world-renowned for their delicious Pan-African cuisine – fresh ingredients, simply prepared with an African flavour. All halaal and vegetarian dietary requirements will be catered for. When making your reservation, please inform us of any specific dietary requirements you may have, and these will be communicated immediately to the camp. Should specific items need to be flown in, there will be an additional charge, which will be quoted separately. Regrettably, we are unable to cater for strictly kosher guests at Lake Manyara Tree Lodge. Travel to Tanzania is recommended for children 8 years and older. Regretfully, children 5 years and younger cannot participate in the regular game drives. Child minders can be booked at an additional cost. Children aged 6 to 11 years are accommodated on game drives at the Lodge Manager’s discretion. An extra bed can be arranged for a child 11 years and younger sharing its parents’ treehouse. No more than 1 triple per night in the camp at any one time. Professional and skilled CC Africa safari guides will lead you on interpretive game-drives in open 4x4 safari vehicles in the game-rich Lake Manyara National Park. Due to the Lodge’s secluded location, there is minimal vehicle intrusion, allowing for leisurely tracking of the Park’s famous tree-climbing lions and uninterrupted viewing of flocks of pelicans and flamingos in the lake. Acacia woodland is dominated by spectacular umbrella thorn, tamarind tree and desert date, with cordia and salvadora shrubs; which are an excellent habitat for large mammals. Floodplains fringing the lake expand and retract according to the levels of the lake and are typically fringed by stands of fever trees and ivory palms. Verdant groundwater forest – dominated by evergreen mahogany and ficus – occurs where water seeps from the Rift Valley wall and along rivers and streams. Marshes and wetlands develop after rain to provide habitat for aquatic plants and animals. The level of the soda-rich Lake Manyara fluctuates through the seasons and from year to year. The vertical rock faces of the Rift Valley wall are colonised by aloes and other succulent plants, while baobab, sterculia and terminalia grow on the lower slopes. Manyara is renowned for its tree-climbing lions which may be seen resting in favoured spots. After a decade of heavy poaching, elephant numbers have recovered and the great pachyderms are regularly encountered – the Park was the site of Iain Douglas-Hamilton’s pioneering work on elephant societies. Olive baboon troops may number up to 200 individuals. Giraffe are abundant with many males being very dark in colour. Small numbers of Heck’s wildebeest (a subspecies of the common wildebeest) favour the lakeshore. Buffalo bulls with enormous horns wallow in the lake shallows, and hippos are regularly seen. Leopard and Cape clawless otter are occasionally encountered. Klipspringers hold territories around boulders at the base of the Rift Valley wall. A remarkable 387 species are recorded. Over a million lesser flamingos may occur on the lake although they do not breed here. Great numbers of white pelican, pink-backed pelican, greater flamingo and yellow-billed stork also populate the lake on a seasonal basis. Countless other waterfowl, including many Eurasian migrants, favour the lakeshore. Birds of prey are represented by a remarkable 46 species including Ruppell’s griffon, Egyptian vulture, palmnut vulture, Verreaux’s eagle, crowned eagle, martial eagle, bat hawk and peregrine falcon. Vociferous silvery-cheeked hornbills inhabit evergreen forest and southern ground hornbills stalk open woodland in family groups. Among the more colourful bush birds are Fischer’s lovebird, blue-naped mousebird, grey-headed kingfisher, Abyssinian scimitarbill, red-and-yellow barbet and Peters’ twinspot. Huge African rock python dwell among boulders and ambush prey in wetlands. Gigantic, cathedral-like termite mounds are the work of millions of these industrious, colonial insects. A variety of colourful beetles and butterflies abound. Interestingly, there are no Nile crocodiles in the lake. Dragonflies and damselflies are prolific at the water's edge. Enjoy a delicious breakfast or picnic on the lakeshore while viewing flocks of pelicans and flamingos with buffalo and hippos cooling in the water. CC Africa guests are now experiencing incredible night drives from Lake Manyara Tree Lodge. They have been treated to lion, leopard, wild dog, large packs of hyena with pups, huge pods of hippo out of the water, porcupine, bush baby, genet cats, awesome night skies and much, much more. Manyara's night drives can be part of the afternoon game viewing extending into the night, or they can commence after an early dinner. The cost of this experience is subject to change (the bulk of these costs are paid over to Lake Manyara National Park in the form of extra park fees). The lodge requires 24 hours notice to organize and reserve night drives, so pre-booking this memorable experience is advisable. Lake Manyara Tree Lodge is committed to CC Africa’s core principle: Care of the Land, Care of the Wildlife, Care of the people. CC Africa’s focus: Community equity, income generation, education and health care are a primary concern. In consultation with community organisations such as the Africa Foundation – originally founded by CC Africa, now a not-for-profit rural development organisation – Lake Manyara Tree Lodge has contributed significantly towards improving the prosperity and living conditions of the local Mayoca community.  Weather: Warm to hot climate year round due to proximity to the equator.  Rainfall: There are two rainy seasons with the so-called short rains being from November to December and the long rains from March to May.  Temperature: Lake Manyara has a warm to hot climate year round due to its altitude and close proximity to the equator. Minimum temperatures are 15°C/59°F to maximum 40°C/104°F, and the heat reaches its peak in the dry months of January and February.  Best time to travel: Superb game-viewing is offered throughout the year but is at its peak from December to February and from August to September.  Malaria: Lake Manyara Tree Lodge is situated in a Malaria area and necessary precautions should be taken.  Camp closure: The Lodge closes during April and May each year during the long rains.